Over the years, I’ve walked and cycled around Blewbury and been inspired to paint many parts of the village… but I’ve always wanted to fit more in. 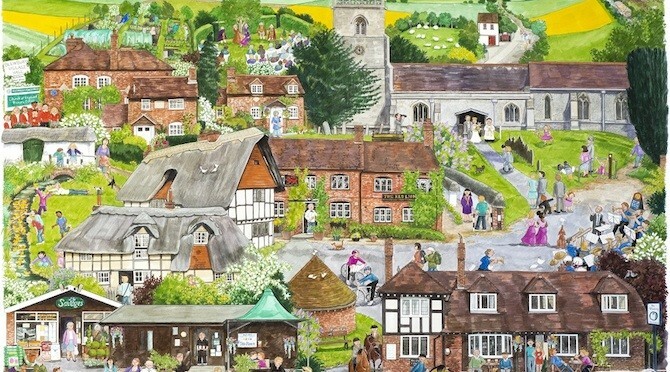 Earlier this year, I chose as many key places as I could and arranged them together in roughly the right order, to create a montage style painting of the village. I use fine pen line and watercolour to capture the scene from Blewburton Hill in the background, to the duck race, plant pots, and people near the front. One of the first montage pictures I did was for the cover of a prayer book for the benefice of the Hagbournes, Upton, and Blewbury. It had something to represent each of the villages including the Blewbury cob walls and one of the Alms houses. Since then, I’ve developed the idea of fitting all sorts of elements together into one picture. Fine Art prints (in 2 sizes) of the Blewbury Montage are on display at the Style Acre Tea Rooms, and at the Framing Studio (126B The Broadway) in Didcot, and also available from the artist. Greetings cards are available at Blewbury Post Office, Savages, and The Framing Studio.